Black holes are among the most mysterious objects in our universe. Space and time are extremely distorted near the black hole and flipped their roles when one falls in. 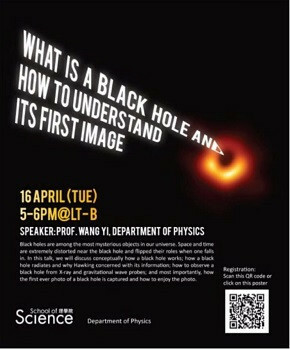 In this talk, we will discuss conceptually how a black hole works; how a black hole radiates and why Hawking concerned with its information; how to observe a black hole from X-ray and gravitational wave probes; and most importantly, how the first ever photo of a black hole is captured and how to enjoy the photo.